I came across this recipe in Saveur and thought little of it because I didn’t realistically foresee myself buying shishito peppers. In fact, I flagged just about every other cauliflower recipe included in the magazine but this one. And then, browsing the aisles at Trader Joe’s, I saw them- shishito peppers! No coincidence, this cauliflower beauty was meant to be. And get this…the sauce has chocolate in it. To make this stunning side, get a head of cauliflower (about 24 ounces) and break it up into large florets. 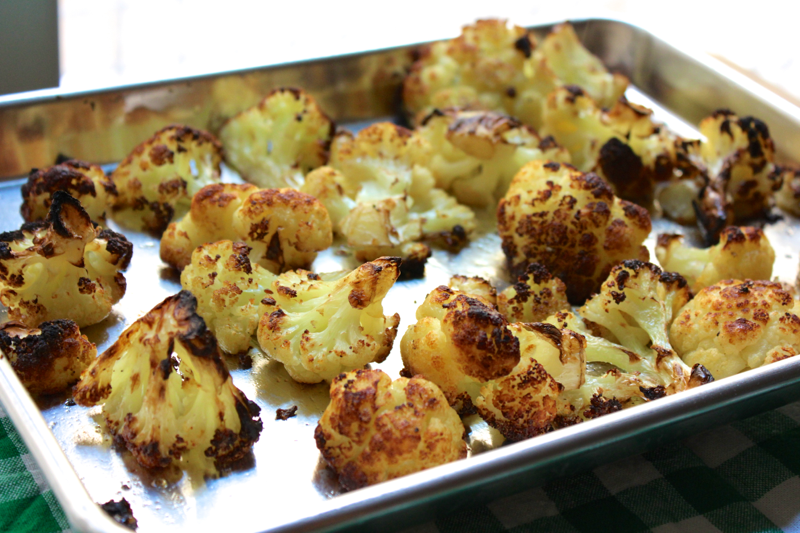 Toss the cauliflower with olive oil, salt, and pepper, and spread it on a baking sheet. Char the cauliflower under your oven’s broiler, flipping it once, until it is slightly blackened and tender. My terrible oven took about 30 minutes to char the cauliflower this much, and I would have liked more. While the cauliflower is cooking, prepare the rest of the recipe. 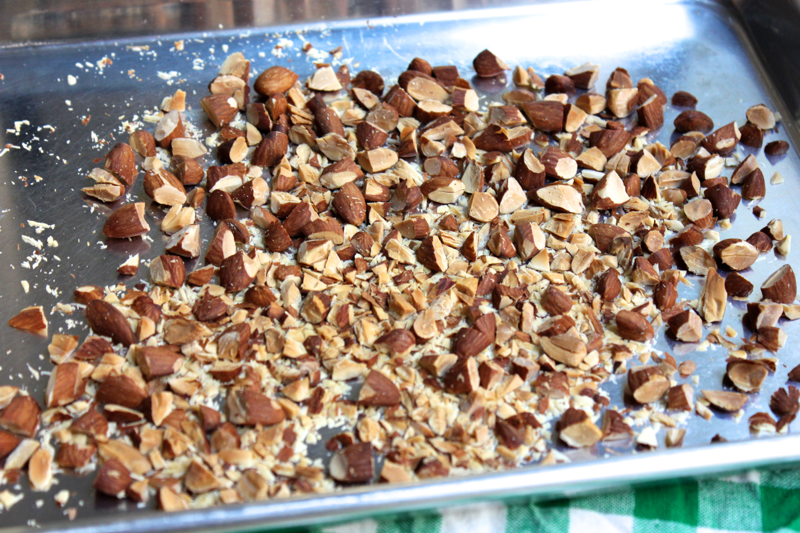 Chop up 1/2 cup of almonds, and toast them in the oven with the cauliflower, but away from the broiler. Once you can smell them or hear them start to crackle, they’re done (5-10 minutes). Chop up 8 garlic cloves, and heat them in a skillet with 1/2 cup of olive oil over medium heat. 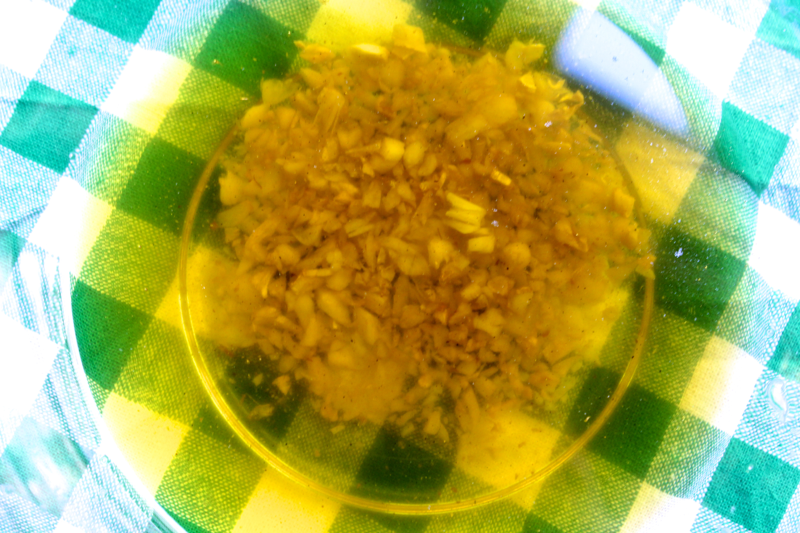 As soon as the garlic starts to brown, transfer the garlic and all of the oil to a side bowl to cool. Garlic oil…yum! 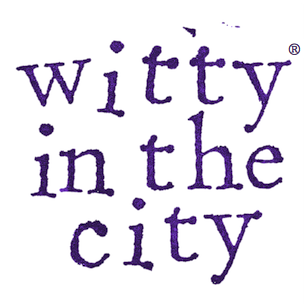 Fill the skillet with about 2 centimeters of vegetable oil, and heat it over medium high. When a small droplet of water sizzles nicely, add in 12 shishito peppers. Cook them on both sides so that they blister and very lightly brown. 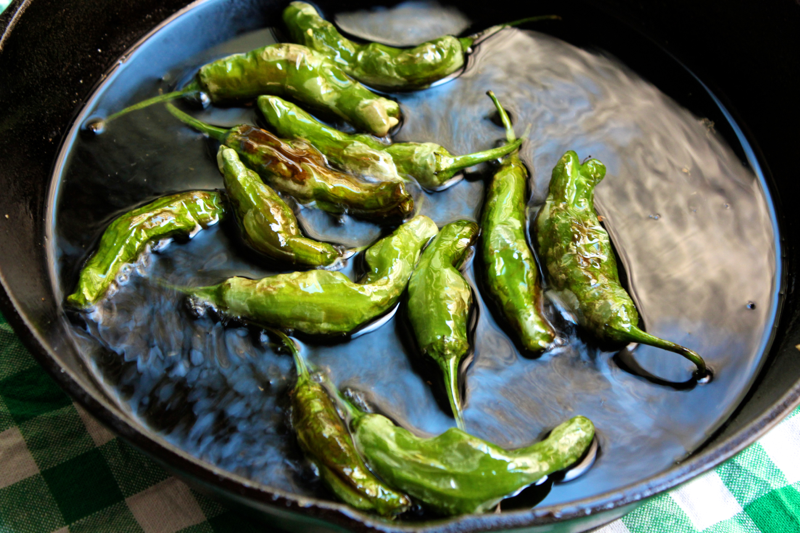 Transfer them to a paper-towel lined plate to drain, and season them with salt. Shishito peppers are crunchy but hollow, more like a skinny bell pepper than a jalapeño. Some of them are spicy and some of them are mild (the bag said 1 in 10 are spicy, but I’d put the number closer to 2 in 10). 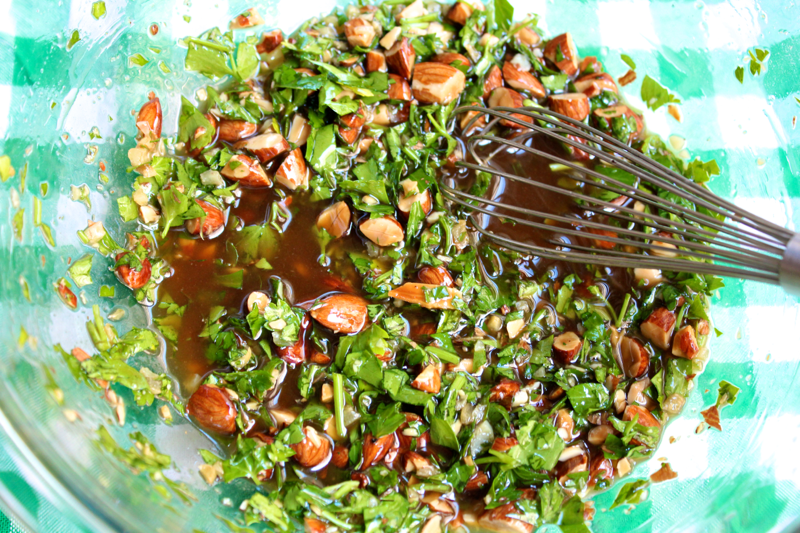 To your bowl of garlic oil, add the toasted almonds, 1 cup of chopped parsley, and 1 tablespoon of finely grated dark chocolate. The chocolate adds a really nice depth of flavor. The recipe also says to add 2 teaspoons of sherry, but I didn’t have it. Without it, the sauce needed a hit of acid, so I added a squeeze of lemon juice. Season the sauce with salt and pepper, then spread it on a large serving platter. Top the sauce with the cauliflower, followed by the shishito peppers, and then more chopped parsley. It’s really gorgeous and it tastes delicious too. With the olive-oil based sauce, I found that this cauliflower paired nicely with couscous. I even turned it from side dish to main course by amping it up with crispy roasted chickpeas and shrimp. This dish looks delicious. 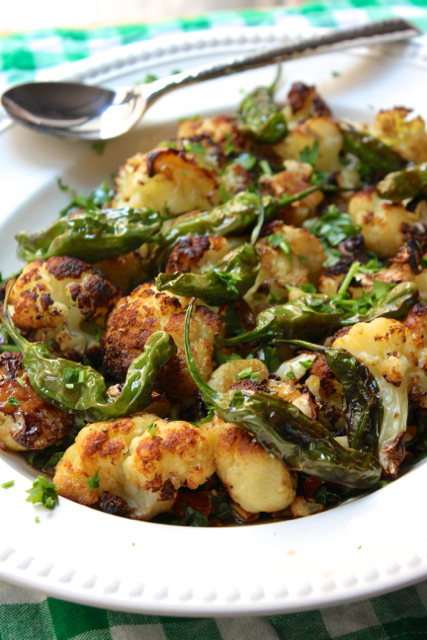 I liked you other Caulifower recipe your posted but this one has some pizzaz to it!! Can’t wait to make it. This dish looks delicious. 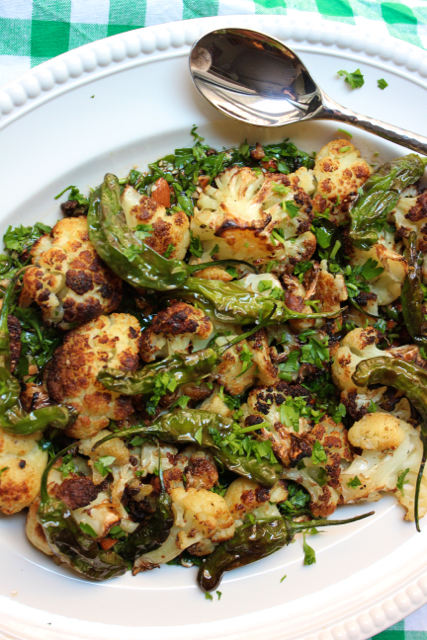 I liked you other Caulifower recipe you posted but this one has some pizzaz to it!! Can’t wait to make it.